I Buckle And Ask For Help (again). It’s taken quite a bit longer than anticipated, but my roof is nearly finished! An old boyfriend came to my aid and helped me haul the super-heavy roll of EPDM up the 14 feet or so to the roof top late Sunday. I’ve been hassling with that stuff for days, and with help it took less than 10 minutes. Thank you, Ray, hope you enjoy the wine! Per instructions, I’d already smoothed out the roof decking and sanded down all the edges. Before rolling out the rubber, I swept thoroughly and double-checked for sharp slivers. Thankfully, I was able to keep the wood clean during it’s construction, so I didn’t need to wash it down. Rolling out the EPDM was easy, and straightening it out was too. A sprinkle of rain started right after the rubber was laid out, which was great timing, phew! The rubber needs to sit and relax for at least an hour after positioning it, and it’s had a day now to do so. The glue-down will be done today. I got side-tracked yesterday at the local ReStore, and bought a bunch of stuff! They had a big roll of 12 gauge electrical wire for $30 (woot! ), enough in theory for my needs. They had a huge amount of really pretty pine trim at .25 cents a foot. I bought about 175 feet, which I hope will be enough…I want to use it throughout Oliver’s Nest for continuity. There is still enough left at the store for another whole Tiny House! There was a bunch of other good stuff, too. 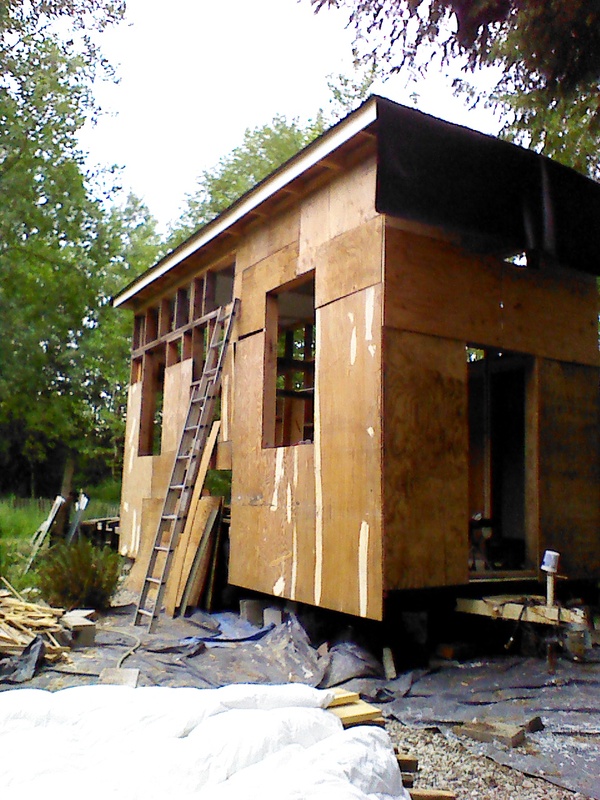 While stewing over how to lift the roofing up, I put up more sheathing. Both ends are done, as well as part of the south side. I wish I could use full sheets of plywood, but they are just too heavy. Instead, I’m using smaller pieces and getting it done. It’s not the best practice, but it’s the one available to me. I’m good with it. I’ve decided to bolt the sections of pre-built studs together to make the frame stronger, since the plywood won’t be doing the job. I still have to put more bolts through to the trailer frame. I just don’t feel confident in the attachment as it stands – I don’t think it currently is strong enough. I’ve also revisited the floor underlayment, which was the first thing I put together. It got soaked through last spring, unfortunately, plus the middle has always been sort of “springy”. I know that’s not right! So to fix the water issue I drilled a ton of holes through to the wool insulation from the top, and a few, smaller holes to the wool from the bottom. To solve the bouncy floor problem, I’ve started cutting out the plywood to see what I did wrong with the joists. It’s giving the dampness another avenue out so that’s a good side benefit. I haven’t finished taking up the plywood yet, so still don’t know why the floor isn’t solid there. It was interesting to note the wool is still fluffy and full, even wet. Awesome! Big day today! The sun just peeked out and I’ll be going up to glue soon…eeeek! Very excited and nervous!